Kim Kardashian is close to her grandmother MJ and on Monday the 38-year-old beauty revealed why. 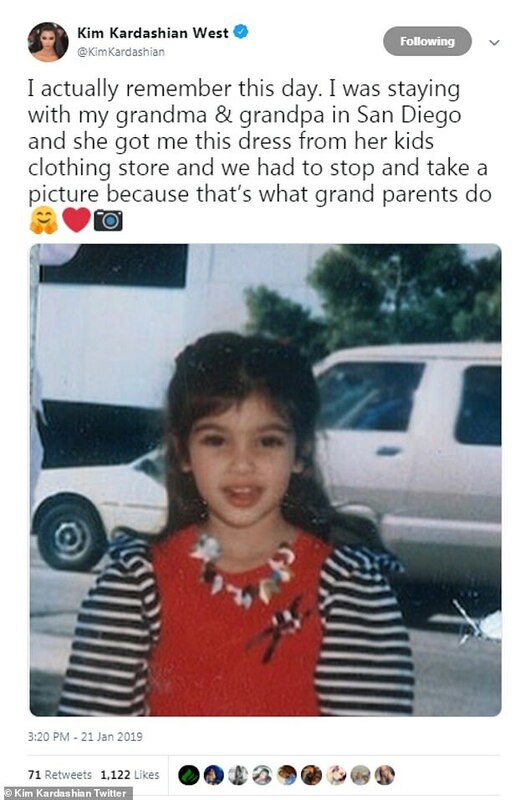 When she was a child, the Keeping Up With The Kardashians star used to stay with her grandmother at her house in San Diego, California, which is a two-hour drive south of Los Angeles. The wife of Kanye West shared an image from one of her trips on Instagram where she looked cute in a dress, reports the Daily Mail. Kim detailed what was going on when the photo was taken. “I actually remember this day,’ began the mother of three. The dress was cute with red on the front and black-and-white sleeves. She also appeared to have on a necklace. This comes after she plugged her new red lipstick. Promoting her latest KKW lipstick shade the reality star titillated fans with her latest photoshoot which saw her soak in a tub wearing a see-through dress. Kim sat back gazing sultrily at the camera with her red lipstick matching her long nails. The snap, shared to the KKW Instagram page, was posted Thursday with the caption: 'Make a bold statement this season with @kimkardashian’s version of the classic red lip. The second part of the message revealed details of Kim's upcoming pop-up on January 23.